Craig’s Mitchell Woelfle (9) pitches against Parker on Tuesday, April 9, 2019, at Riverside Park in Janesville. 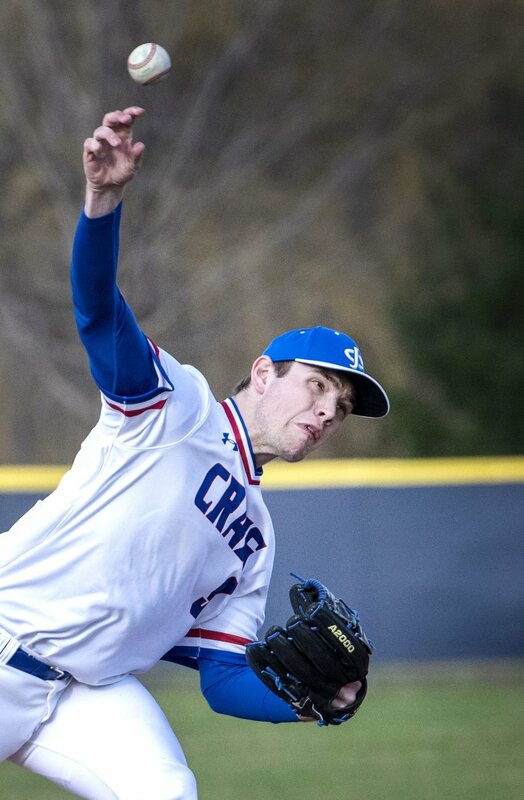 Mitchell Woelfle, Janesville Craig baseball—The senior righty pitched 13 of Craig’s 14 innings this week. He threw six innings, striking out 12 and allowing two hits in a 7-0 shutout of Janesville Parker on Tuesday. On Saturday, he put together a complete-game four-hitter in a 4-1 win over Verona. Remington Stark, Parkview softball—The Vikings junior righty finally got a chance to pitch against Beloit Turner and made the most of it. Stark struck out 17 batters in a complete-game four-hitter, and Parkview won the nonconference battle 7-1. Ryann Porter, Janesville Parker girls track and field—The junior is off to a solid start again after qualifying for state in multiple events last year. Porter won four events Tuesday night to lead the Vikings over Madison West. Porter has already put together a triple jump mark of 35-11.5, putting her in the top five in the state in Division 1 so far. Chrissy Hughes, Milton girls track and field—The junior is already within range of her top times last year in the 100-meter hurdles. Hughes’ time of 15.36 gave her the girls title in the Badger Conference Challenge meet Tuesday and put her in the top three in the state in D1 to this point. Joe Forsting, Edgerton boys golf—Forsting fired an 80 to finished tied for third at the Stoughton Invite on Tuesday at Stoughton Country Club. The Crimson Tide, ranked second in the state in Division 2, shot 341 to finish second behind only Verona (330). Big week for Craig baseball—Craig’s baseball team is 6-0 overall and 4-0 in the Big Eight Conference, and those marks will be tested this week. The Cougars will take on Parker in a make-up game Monday at Riverside. Then they play a home-and-home with league rival Sun Prairie on Tuesday and Thurday—the latter of the two games coming at Riverside. Craig also plays at Burlington in a nonconference game Saturday. Parkview vs. Palmyra-Eagle, baseball, 5 p.m., Monday and Thursday—The two former Rock Valley rivals—now in the Trailways—square off on the diamond twice this week, with Monday’s game taking place in Orfordville. Tri-City Golf meet, Friday and Saturday, at Glen Erin, Janesville—The city’s boys golf teams really ramp up action this week, including facing off with one another—and Beloit Memorial and Fort Atkinson—in the Tri-City meet at Glen Erin. Spring break ... what break?—It’s spring break week in Janesville, but the city’s softball teams will each play four times in five days. Parker hosts Middleton on Monday and Madison West on Tuesday and plays at Madison La Follette on Wednesday and Madison Memorial on Thursday. Craig hosts East and West on Monday and Wednesday and goes to Middleton and Turner on Tuesday and Friday. Whitewater at Jefferson, softball, 5 p.m., Thursday—The top two teams in contention to dethrone Beloit Turner meet Thursday. The Whippets won the first meeting between the teams 13-7.